The History Project’s proposal was approved by the City’s Economic Development Corporation, which issued an RFP in November and transferred ownership to the nonprofit organization a few days ago. After Astroland lost its lease in 2009, the Rocket was removed from atop Gregory & Paul’s roof, where it perched for decades and had become part of the store’s vernacular signage. 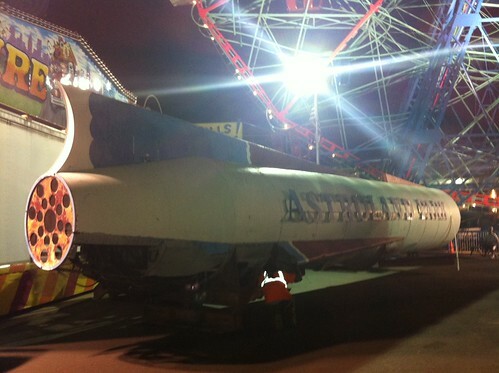 The space ship was donated to the City of New York by Astroland Park owners Carol and Jerry Albert. “The Rocket will become a permanent and iconic part of the 27 acre redeveloped amusement district in Coney Island,” said the press release from the Coney Island Development Corporation on January 28, 2009, the day the Rocket left Coney Island. This summer, Wonder Wheel Park’s Steve and Stacy Vourderis hope to make the Rocket the focal point of the park’s annual History Day celebration on August 9th. But it may take awhile before the 26-seat Astro theater is in shipshape to welcome a new generation of space adventurers. The 71-foot-long, 12,000-pound Rocket was damaged during Superstorm Sandy while in storage at the City’s Staten Island Homeport facility. 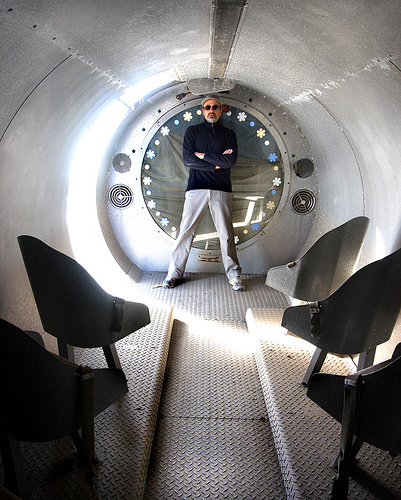 The restoration of the Rocket is in the very capable hands of Steve Vourderis, who meticulously restored the Wonder Wheel for the first time when his family bought it 30 years ago and has kept the 1920 landmark and the park’s other rides in perfect condition ever since. 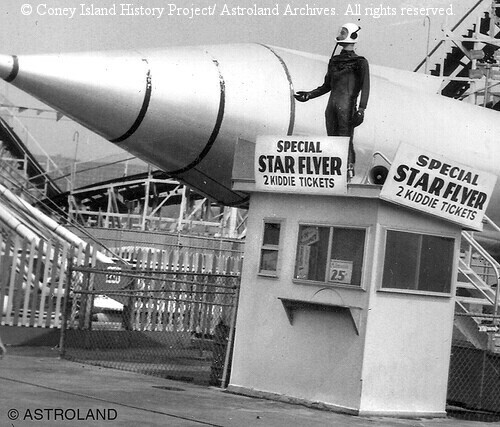 The Rocket joins another survivor of Astroland in Wonder Wheel Park. The Bumper car ride with its distinctive rainbow marquee was refurbished and brought back to Coney Island in 2012. Signage from the Musik Express, Water Flume and other rides are in the collection of the Coney Island History Project. In the Washington D.C. area, one of the 8-foot by 7-and-a-half-foot lighted stars from the park’s gate, which was selected by curator Margaret Weitekamp for the Smithsonian Air and Space Museum’s collection, is slated to go on display next year in the Museum’s Steven F. Udvar-Hazy Center .